Matt Miller is an educator, blogger and presenter from West Central Indiana. He has infused technology and innovative teaching methods in his classes for more than 10 years. He is the author of the book Ditch That Textbook: Free Your Teaching and Revolutionize Your Classroom and writes at the Ditch That Textbook blog about using technology and creative ideas in teaching. He is a Google Certified Innovator (Austin ’14), a PBS LearningMedia Digital Innovator, a Bammy! Awards nominee, and winner of the WTHI-TV Golden Apple Award. I taught high school Spanish for 11 years in small, rural public schools in West Central Indiana. As more and more tech resources became available, I loved experimenting and finding creative, innovative uses for them to kick learning up to another level. I don’t consider myself an “expert” — just someone who’s willing to experiment, create and share what he’s doing. The collaborative nature of many tech tools, where students are able to work together and improve teamwork, communication, etc. while doing classwork. The global nature of tech, where we can invite other classes and experts into our classes for free and as easily as doing a FaceTime call to grandma. The ability to create learning products to demonstrate learning that are better and/or different than creating them by hand in the real world. 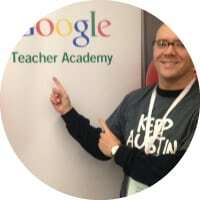 I’m a huge fan of the Shake Up Learning blog by Kasey Bell, who is my co-host for the Google Teacher Tribe podcast. The #DitchBook Twitter community constantly impresses me and pushes me with the innovative things they’re doing with tech. I love listening to podcasts, and one of my favorites right now is StartEdUp by Don Wettrick, which gets a take on education from movers and shakers in the entrepreneurship world. Seth Godin‘s books (Tribes and All Marketers Lie/Tell Stories) have had a huge effect on me. I love creatives like Austin Kleon who encourage people to create. I’m big into sketchnotes, so Mike Rohde (author of The Sketchnote Handbook) is a favorite of mine. The powerhouses of Google and Apple are undeniable in education, and students are doing great things with them every day. Digital tools like Formative, Flipgrid and Quizizz are ones I recommend on a regular basis. I do a lot of speaking to teachers right now, so that’s probably the best opportunity.